This year is the last of our ‘First Christmases’ I say that with some finality. We are NOT having any more babies. There will be no more ‘Baby's First Christmas’. It makes me feel a little bit sad that after this year there will be no more teeny Christmassy baby grows adorning the radiator. Babies at Christmas are just magic, the look on their little faces as they watch the dancing fairy lights, the interest in the wrapping and not caring about the contents – bliss. For us it’s double the magic as our newest twins are celebrating their first Christmas. They’ve already worn their Christmas outfits several times, maximum usage before a. its not Christmas anymore and b. they grow out of them. I’ve ordered keepsake baubles with the babies’ names and ‘First Christmas’ - not for them really, but for me, and to join the other 4 already hanging on the tree. 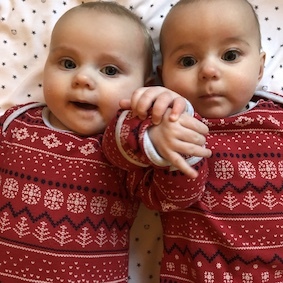 As these are babies 5 & 6 we are fairly well practised at babies at Christmas – so what am I doing to prepare? 1. Stock up on nappies – no-one wants to join unnecessary Christmas queues to buy nappies. 2. Have a spare outfit at the ready. The girls have some absolutely beautiful festive clothes that they have been given. But, they don’t know what day it is, or that the outfit is particularly special so being armed with spares in case of sick and the yellow stuff is a must. 3. Plan quiet times. 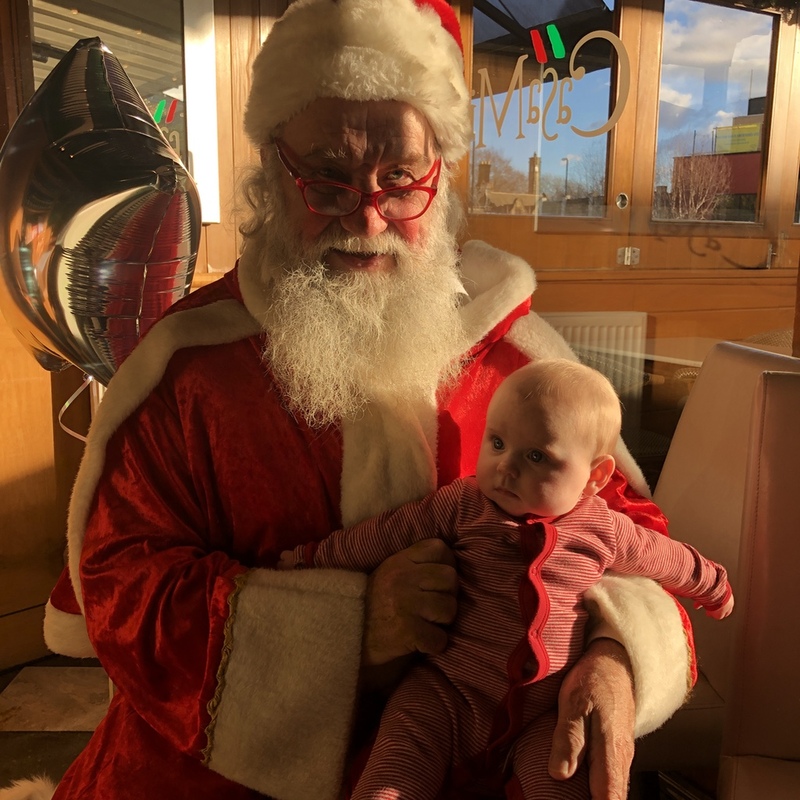 Christmas is FULL ON, and babies find that too. Prepare quiet times, or space where you can be for quiet feed or cuddle with baby. I disappear to the babies’ nursery for feeds away from the noise and the demand for baby cuddles. 4. Think temperature. Warm rooms, log fires, fluffy jumpers can all be too hot for babies. If I know the house is getting warm (I use a Gro Egg) then I change the babies into lighter clothing and remove blankets. 5. Have a break. Christmas can be so tiring, especially if, like me, you are not getting much sleep yet. Plan time out and don’t be shy to tell visitors that it’s not convenient to come or that it’s time to leave! 6. Share out the jobs. We are hosts this year to 18 magnificent people. Everyone has been given food to prepare and bring. Everyone will be given jobs to do, we are not a hotel! 7. Know where to go and who to call if you have an emergency or your baby is unwell. Some services are reduced at Christmas and some GP surgeries will close, if in any doubt call 111 or if a medical emergency call 999. 8. Our babies are just weaning so we’ll be stocked with baby rice, fruit and veg to mush and we’ll let them try some softened vegetables baby-led too. In the busyness of hosting it’s important that someone is always sitting with babies and children when they are eating and knows what to do if they choke. 9. And not forgetting me. I am so aware of my mental health fluctuating responding to changes in hormones I have to plan my time-out. Christmas time can exacerbate feelings of helplessness, not coping and post-natal depression. If you are feeling down tell someone. 10. Deep breath. We are bombarded in the social media world with images of what Christmas should look like, remember it’s all created to look pretty. Actually, if you don’t wear a sparkly jumper, stay in your PJs and baby cries and sleeps through the whole event, it doesn’t actually matter. Wishing you, your family and little ones a very Merry Christmas. Kate, Matt and all the team at Mini First Aid.